Jeremy Walker, chair of the innovative ‘Slowing the Flow’ project in North Yorkshire, explains how a range of land management measures are helping to reduce flood risk in the market town of Pickering. 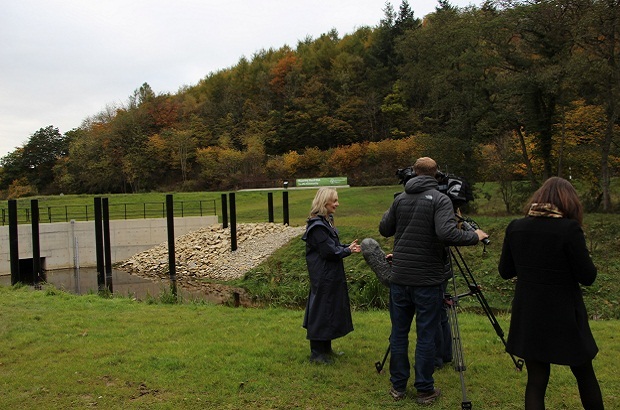 The project, which was officially completed this autumn, was recently opened by Defra Secretary of State Elizabeth Truss. The beautiful National Park of the North York Moors comprises a plateau with deep valleys. The rivers flowing off the moors rise rapidly after heavy rain – and there is plenty of rainfall to feed them! The towns and villages in the Vale of Pickering on the south side of the moors are particularly prone to flooding. Pickering itself has flooded four times since 2000, but costs of conventional defences are not affordable. After the 2007 floods, when DEFRA were seeking bids to look at alternative ways to reduce flood risk by using natural processes, a local partnership came together and made a successful application to demonstrate how this could work in practice, in two neighbouring catchments – Pickering Beck and the River Seven. The resulting ‘Slowing the Flow’ partnership project works with nature to help alleviate flood risk. It uses a wide range of measures which work together at the catchment level to mitigate flooding downstream, as well as to provide multiple benefits to local communities. On the high moors, channels known as “grips” that cut through the peat to improve drainage are being blocked with bales of heather made on the spot – over 180 so far. This reduces run-off and increases the amount of rain absorbed by the peat. It also decreases peat loss and should help to improve water colour and quality. Grouse shooting – an important part of the moorland economy – traditionally requires a cycle of heather burning and regeneration. This covers patches of moor and accelerates run-off. So along moorland streams no burn zones have been created through agreements with the landowners. Low growing scrubby heather protects the soil surface and allows the peat more time to absorb rain water. Woodlands are another integral part of the project. Trees have long been known to reduce flood flows by evaporating more water, increasing water absorption by the soil, roughening up land surfaces and decreasing soil erosion. Over 40,000 trees have been planted to date in the two catchments targeting vulnerable soils and slopes. Through these measures rain water is taking longer to get into the rivers and their tributaries. Here flow is further slowed and flood water stored by over 160 large woody debris dams. 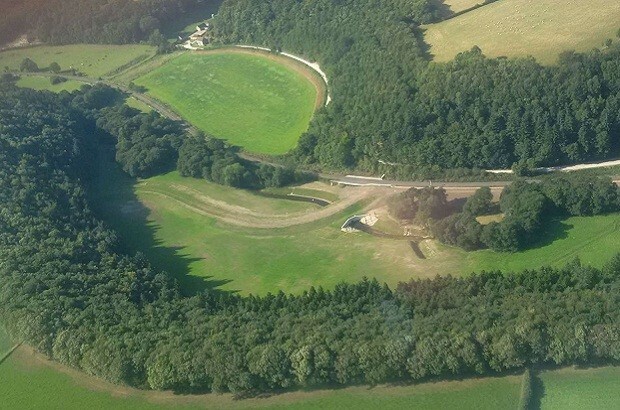 These ‘leaky’ dams are playing a very important role by impeding flood flows and pushing them out of bank onto small, localised patches of flood plain; low flows and fish pass unhindered beneath. They are cheap, quick and easy to build and very cost effective. On a somewhat larger scale we are also trialling two larger timber storage bunds, designed to hold 1,300 and 3,600 cubic metres of flood water respectively. Now 4 years old these have already been called into action during a near-flood in November 2012, but have yet to be tested by a large flood. Made of conifer trees felled in situ each cost only about £5,000 to build – again a potentially very cost effective way to hold sizeable amounts of flood water in a catchment. Modelling showed however that these measures would not achieve the desired improvement in protection on their own – the objective was to reduce the chance of flooding in Pickering from 25% to 4% in any one year. A substantial extra element of flood storage would be needed. Various proposals ranging from a large number of small ponds to a single engineered flood storage reservoir were explored. In the end it was agreed that a scheme designed to reconnect the main river to a 30 hectare storage area of usable flood plain would work best. The flood storage area, which was completed in September 2015, was constructed by the Environment Agency, and funded by a number of partners. It uses a low clay bund to retain up to 120,000 cubic metres of flood water forced out of channel by a simple culvert-style control structure. The pasture land involved will continue to be used for grazing. Does it all work? The individual measures are each doing the job they were intended to do. Together there is some anecdotal evidence that the land management measures are already acting to smooth out and reduce flood peaks – this is what local people observed in November 2012 when many expected flooding to occur. Scientific data collected so far is not conclusive – but monitoring continues. My own belief is that the range of measures and the way in which they clearly complement one another will deliver much more than the planned standard of protection. As a demonstration project it is leading the way in showing how we can work better with nature to reduce flood risk at the catchment scale, as well as to provide multiple benefits for affected communities. It is very encouraging to see the lessons learned starting to be applied elsewhere, supported by national funding initiatives such as the Countryside Stewardship scheme. There is obviously much more to do, so watch this space!